Portuguese native and resident of New York, André Matos plays the guitar since the age of nine. He was interested in the pop rock bands of the moment and of the past, and soon developed a deep love for the Blues of Muddy Waters, BB King or Albert King. And from there, he got into some of the jazz records his parents had around. Matos came to Boston at a young age and holds a Bachelor´s of Music from Berklee College of Music and Master’s Degree in Jazz Performance from New England Conservatory. His most important teachers were Mick Goodrick, George Garzone, Danilo Perez, Brad Shepik, Hal Crook and Jerry Bergonzi. Moving to New York in 2008, Matos has been collaborating with different projects and many musicians, having toured the US, Panama, Uruguay, Argentina, Brazil, Australia and all over Europe. 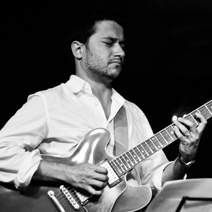 With an extensive discography as a leader and as a sideman, his 2012 trio recording was acclaimed by the New York Times: “The Portuguese jazz guitarist André Matos has a beautiful new self-released album, ‘Lagarto’ [available at lagarto.bandcamp.com], which highlights his capacity for fluid lyricism.” For more, go to www.AndreMatosMusic.com.